During Mass Effect: Andromeda, the player will assume the role of Ryder, a recon specialist on the human Pathfinder team as part of the Andromeda Initiative. There are two Ryder siblings but only one can be picked as the player character. A quickstart of the game can be done with Scott or Sara Ryder. 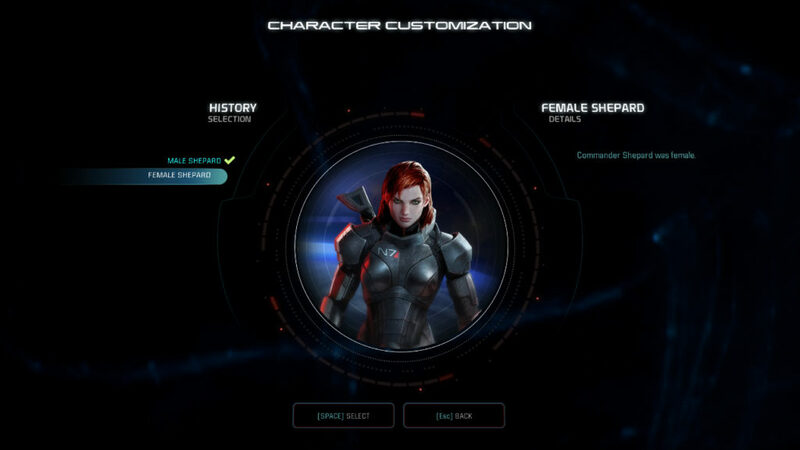 Players also have the option to fully customize Ryder by choosing their gender, appearance, training and name. If you the player keeps the name Scott or Sara for the player character, others in the game will often refer to Ryder by their first name but will only use Ryder should another name be chosen. 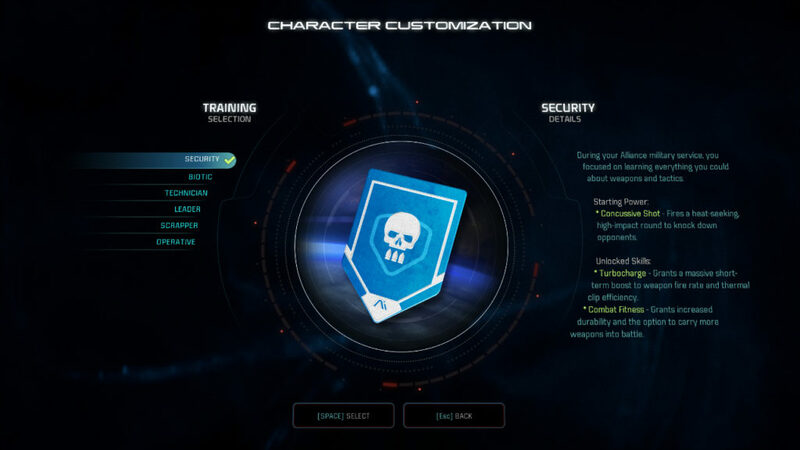 The Training selection offers several options for training backgrounds and is similar to class selection in the Mass Effect trilogy and determines Ryder’s starting abilities. However, Ryder is able to access all abilities regardless of class, though some may take time and skill investment to unlock. As Ryder gains experience, they will be able to learn and improve skills in three categories: combat, biotics, and tech. This is explained by the events happening during and after the prologue of Mass Effect Andromeda. Ryder will be linked to a Simulated Adaptive Matrix, or SAM, an artificial intelligence, via a neural implant. Their connection will allow the profiles to be unlocked and Ryder to have access to a variety of abilities and bonuses. The Ryder twins were born on the Citadel in 2163. They both received informal military training from their father, Alec Ryder, who was N7. Their mother, Ellen Ryder, was a ‘pioneering designer of biotic implants’. Both Ryder siblings joined the Alliance. The rest of their background depends on which Ryder the player will pick. The male twin was assigned to an outpost overseeing Relay 202 near Arcturus Station. The female twin served as part of a peackeeping force and assisted Prothean researchers in their search for new discoveries. There is no psychological profile or morality to pick at the beginning of the game. As abilities in each class (Combat, Biotics, and Tech) are unlocked, related profiles will increase in rank. Each profile grants bonuses that grow as the player gains in ranks. Bonuses range in scope from increase in weapon accuracy to the ability to stealth while evading or biotically blink through walls. 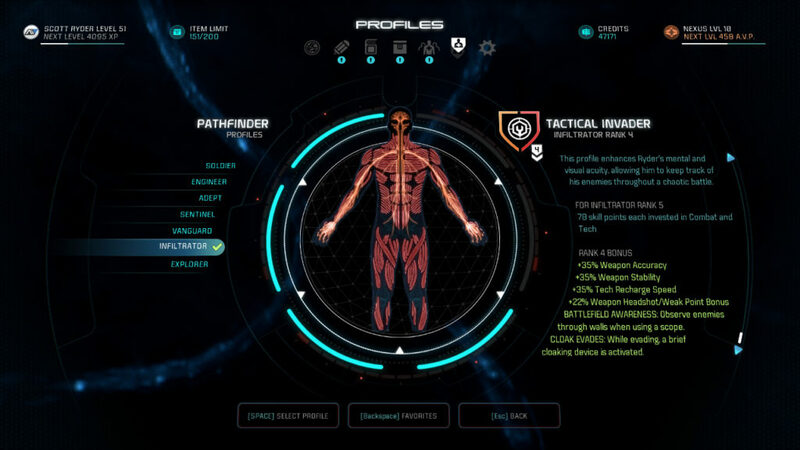 All the profiles, with the exception of Explorer, can be found as classes in previous Mass Effect games. More on them here. 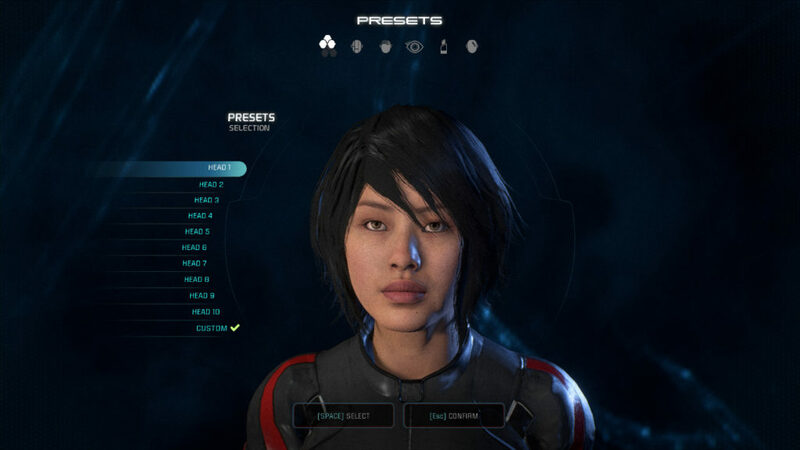 Profiles are unlocked after the prologue of Mass Effect: Andromeda. Ryder will be linked via a neural implant to a Simulated Adaptive Matrix, or SAM, an artificial intelligence. 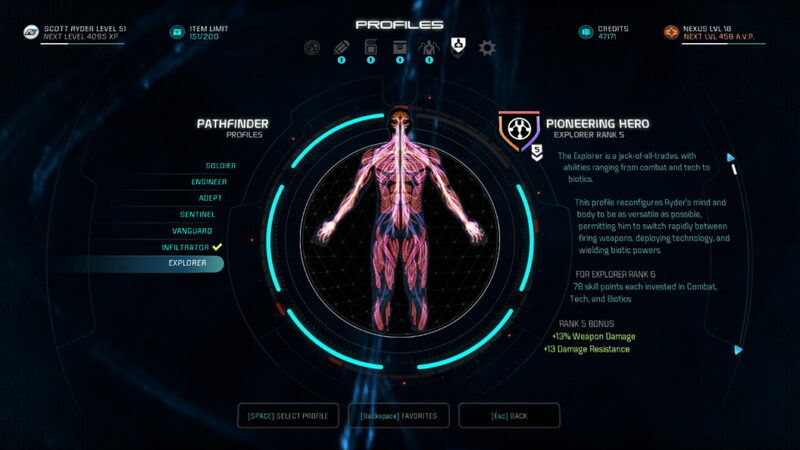 Their connection will allow the profiles to be unlocked and Ryder to have access to a variety of abilities and bonuses. 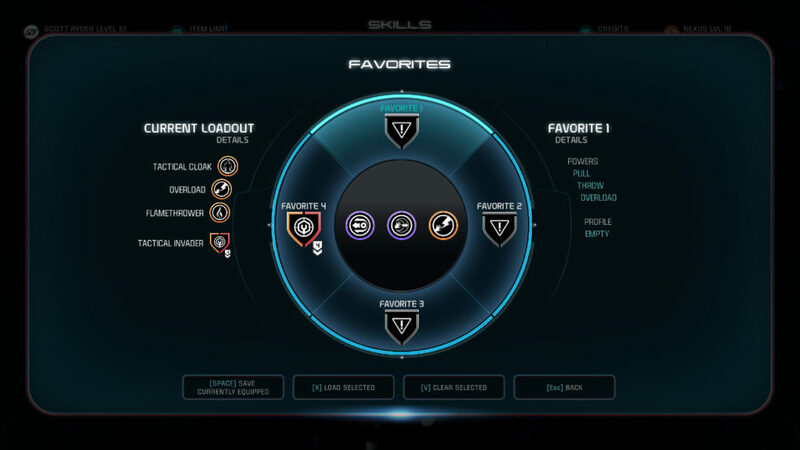 Favorites allow Ryder to swap out skills and profiles during a fight. Four fully customizable favorite loadouts can be saved at a time, each with three abilities and a single profile. Ryder can have a loadout that is not saved as a favorite, but it will not be saved unless a favorite loadout is replaced. On PC, favorites are bound to the keys F1-F4 and can be changed instantaneously, while on console (XBox One and PS4) they must be accessed through the Favorites menu.